Law enforcers did not intervene. Several hired heavies, also known as titushkos, have assaulted Automaydan activist Vitaliy Ustymenko and Euromaydan Civic Sector activist Oleh Slaboshpytskyy in Kyiv's Solomyanskyy district court after it released Odesa mayor Hennadiy Trukhanov on surety. According to an LB.ua, they were attacked in the corridor outside the courtroom. After the court announced its decision, Ustymenko and Slaboshpytskyy publicly expressed their discontent. One of the MPs who was there pointed at them and ordered their expulsion. The attack followed. Law enforcers stationed inside the court did not explain to journalists why they chose to ignore the incident instead of sending titushkos out of the building. An LB.ua correspondent heard the police describe the titushkos as "Odessa residents". There were several scuffles as the court was hearing the case of Trukhanov who is suspected of embezzlement through abuse of office. 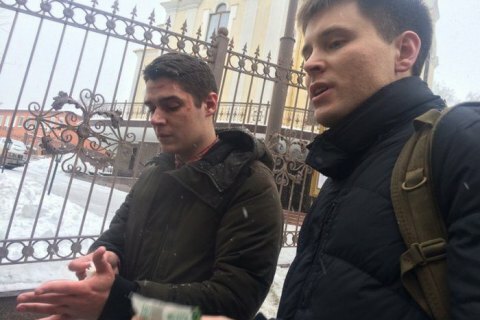 Several dozen young people of "particular appearance", wearing black hooded jackets, came to the court in the morning to support Trukhanov. A clash broke out between them and representative of right-wing organisations such as National Militia, National Corps, C-14, Freedom and Right Sector. The right-wingers attempted to enter the court and clashed with police. During the second scuffle, one of the nationalists, presumably from the Donbas battalion, wounded a police officer from a gun. West Ukrainian mayor: "Take a naked woman down"